April Kennedy...My Life + My Style: A Day at the Beach - From First Half of our Vacation. A Day at the Beach - From First Half of our Vacation. 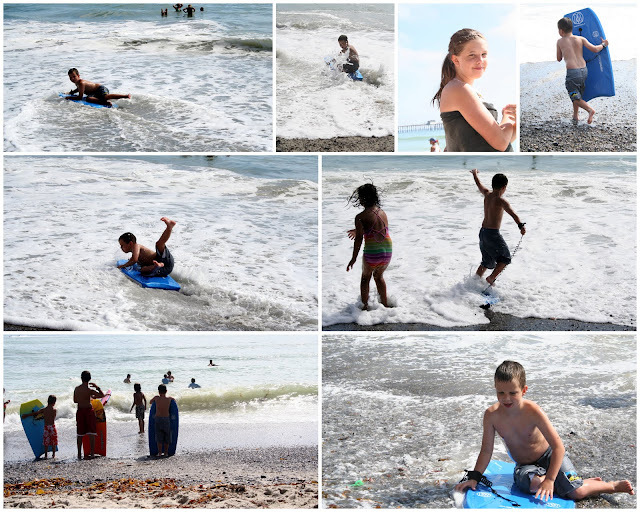 Pictures from our day at the beach. The day my brother died. I don't really like that word. I would prefer passed away or passed on. But Dave doesn't like those words. Neither do I really. Anyway, our day at the beach was fun. ping ponging off one another from the crazy force of the wave. For some reason, we stayed out there for more waves. trying to use their boogie boards as skim boards. It was way too rough to boogie board. And here is a funny outtake from our sunset family picture. Dave and I leaned in to kiss, without prompting. it usually ends with a little kiss. Just a reminder that we love each other and love laughing together. Our friend, Natalie, caught the kids reaction to our kiss on camera. And, this is my favorite picture from our first half of our vacation. Oooh! Like the DK's tattoo! 80s punk rock rules!! !